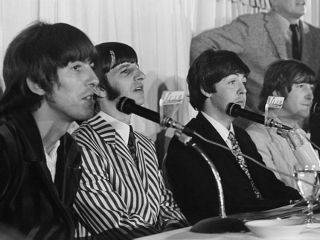 An audio recording of a Beatles press conference from 1966 will be auctioned on 13 June at Bonhams & Butterfields in Los Angeles, where it is expected to fetch somewhere in the neighborhood of $25,000. A young photojournalist made the recording that contains approximately 14 minutes of The Beatles fielding questions from reporters at the King Edward Hotel in Toronto, Canada on 17 August 1966 - just 12 days before the band gave their last official concert at Candlestick Park in San Francisco, California. "It's a very heavy press conference, and quite amazing to listen to," says Margaret Barrett, Director of Entertainment Memorabilia for Bonhams & Butterfields. "Unlike a lot of the wacky and fun-filled interviews The Beatles had done in the past, this one was very somber in tone. But it was still chaotic in parts - after all, it was The Beatles, and the journalists in the room were shouting over one another to get their questions in. "The Beatles were being asked their opinions on some very weighty topics," says Barrett. "They were asked about the Vietnam War, the generation gap and, of course, John Lennon's very controversial comments about the band being bigger than Jesus Christ. John was the focal point during the interview, as you would expect. And he answers the 'Jesus Christ question' very matter-of-fact. He doesn't backpeddle or apologize." Barrett says there is some levity during the press conference, however, especially when one reporter asks the band how long they expect to stay together. Lennon responds, "We're obviously not gonna go around holding hands forever" and McCartney adds "...it would be a bit, you know, embarrassing at 35..."
According to Barrett, the journalist who recorded the audio worked for the Canadian newspaper The Spectator. He attempted to wanted to sell the tapes in 1966 for $50 and nobody was interested. So he put them in a drawer and forgot all about them until recently. For more info on the auction, contact Bonhams & Butterfields.